"We have all heard the La Nina rumours and are expecting another great snow filled season," says Dan Markham, Director of Marketing and Sales at Ski Banff Lake Louise Sunshine. The Lake Louise Ski Area will kick off the season running the Glacier Express Quad and the Sunny T-Bar allowing guests to ski on: Wi waxy, Bald Eagle, Easy Street and Sunny Side runs. "With some help from Mother Nature in terms of natural snow fall, as well as cooler temperatures, we've been able to work diligently making snow" says The Lake Louise Ski Area President Charlie Locke. 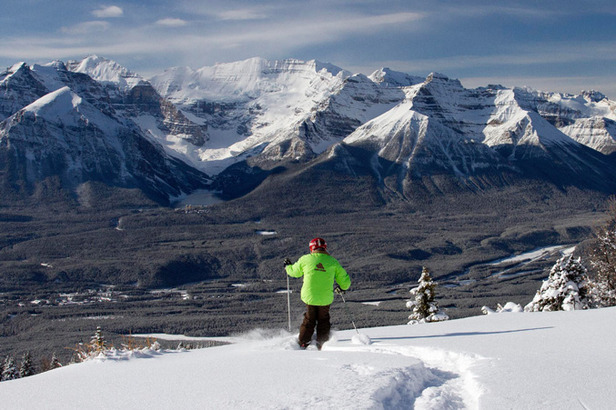 Lake Louise has far more acres of natural snow than any other ski resort in Alberta including its famous back bowls, the extensive upper mountain, and the groomed cruising runs in the Larch area which together offer more runs than most skiers can cover in a week. To complement, new upgrades this year to what was already one of the largest, most sophisticated grooming and snowmaking systems in the world, will help ensure snowsure conditions from November to May. Having good snow coverage is important for the resort as they host the first World Cup Downhill race of the season. The men's race is held on the November 26th weekend with the women racing the following weekend.